If you or a loved one has received a scoliosis diagnosis recently, you will probably be meeting doctors and other experts soon in order to begin the treatment process. You will probably find yourself doing a heavy amount of research, as well, to determine the course of action that is most likely to produce the best solutions. Because I am an expert on scoliosis, patients, parents and people just like you come to me seeking answers and advice on a daily basis. They are eager to learn more about the condition and what treatment might look like. They expect me to provide them with solid information, which I am happy to do. But they do not always know what to ask. If you are curious about next steps for scoliosis and want to prepare yourself with the right questions to ask — whether you are meeting with me or any other medical professional — it is critical that you ask the right questions. Otherwise, you may choose a treatment path that is not appropriate for you or your loved one. There are numerous great questions to ask when you meet with a chiropractor or doctor regarding a scoliosis diagnosis. And each patient is different. The questions that are essential for one patient to ask may be different from those that are appropriate for another patient. That being said, I would like to highlight five key questions to ask before treating scoliosis. The following questions will help you engage in a productive dialog with your doctor or chiropractor that leads to the best-possible treatment approach. For most doctors and chiropractors, scoliosis is one of a multitude of conditions that they diagnose and treat. They may be qualified to tell you that scoliosis is present and requires treatment. And they can perform a Cobb Angle measurement. But if they are not primarily focused on scoliosis, they may not be able to recommend the most beneficial approach to treatment. The majority of doctors take a single-minded approach to treating scoliosis. This approach involves observation, bracing and surgery. They do not employ modalities such as exercise, physical therapy or scoliosis-specific chiropractic care. The best outcomes for scoliosis patients happen when a variety of treatment methods are used in conjunction with each other. For example, the Scoliosis Reduction Center combines scoliosis-specific chiropractic treatments with specialized physical therapy and exercise plans. Custom-designed braces are also employed using this treatment approach. This ensures that each treatment method works together with the others, and they build on one another. Approaching the condition from multiple angles increases the likelihood of reducing the abnormal curvature considerably. Therefore, it’s critical that you assess the different approaches that a medical professional is capable of performing before moving ahead with treatment. Again, this question will reveal a lot of information about a doctor or chiropractor’s ability to treat scoliosis effectively. If they can report improvements or reductions of abnormal curvatures when treating similar patients, that’s great news! But if they can only report modest successes, or reveal that surgery was necessary in most cases, you should keep your treatment options open. I would also be wary of doctors or chiropractors who are unable to provide information regarding the success of their treatment approaches. I am surprised that this question doesn’t get asked more often. But with so much on patients’ and parents’ minds, it’s understandable. 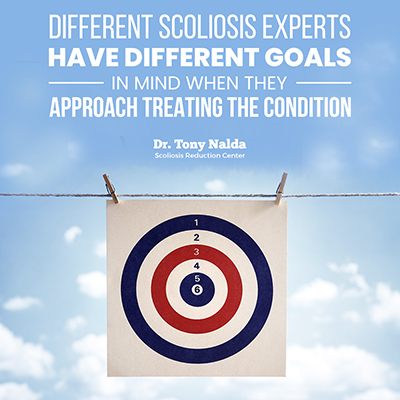 Different scoliosis experts have different goals in mind when they approach treating the condition. Some will move forward very conservatively, with a goal of using surgery once the curvature has progressed into “severe” territory. Others will make big claims about the goals they hope to achieve, but they will be unable to provide examples of success. The goal of treatment here at the Scoliosis Reduction Center is to reduce abnormal spinal curvatures and help patients avoid surgery. Honestly, I think this should be the goal of any approach to treatment. Why? Because I know it is possible to achieve this goal more often than not. And I have patients from all around the world who can attest to our ability to achieve the goals of reduction and no surgery. Are you curious about the questions you should ask your doctor or chiropractor about scoliosis treatment? The five questions I’ve highlighted here will give you a good start, but you can always benefit from increased knowledge and awareness. If you’d like to learn more, I encourage you to call the Scoliosis Reduction Center today at 321-939-2328.